So after six months of complete oblivion from the cyberspace, Richard D. Gill has finally re-emerged and responded to my derivation above with a lame excuse. Without showing any remorse for his previous actions, he now claims that "[my] proof relies on a novel calculus rule for computing the product of two limits." 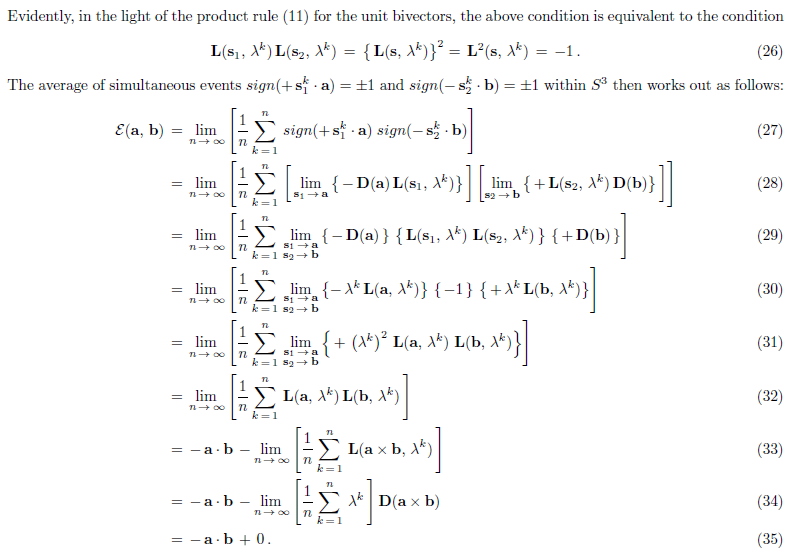 The "product of limits equal to limits of product" rule is indeed a "novel calculus rule" for anyone who has never sat through an elementary course in calculus. Evidently Gill has run out of all excuses. Whenever he is cornered like this, his strategy has been to write malicious letters, like a disgruntled old granny, to my academic superiors, such as to the President of my college at Oxford University. I am neither the first nor the only person against whom Gill has used this tactic. So now I await a renewed campaign of malicious letters. Perhaps he will now write to the Scientific Director of the Einstein Centre for Local-Realistic Physics. Unless that quoted or paraphrased was a private communication, I take it there is an available link to the relevant Gill article or posting or whatever it was? Q-reeus wrote: Unless that quoted or paraphrased was a private communication, I take it there is an available link to the relevant Gill article or posting or whatever it was? Thanks for the link Joy. You didn't miss anything. A lot of scrolling and hunting will reveal that Gill replied a week ago, in part, "The proof relies on a novel calculus rule for computing the product of two limits. I am no longer spending time on this topic - there is really nothing more for me to say on the Joy Christian theory, and the only new development has been this new proof, which in my opinion speaks for itself." I believe that was before Joy published the clarifying eqns. 26-35. In fact, that the product of two limits is the limit of two product is not controversial. It follows from the central theorem of calculus. Or you can scroll to the bottom and "load more comments". Of course Gill will never publicly admit that he was wrong. Once again he seems to be tripped up on the physics of the situation. His original complaint was about when Joy had the limit as s --> a and s --> b in the same expression. In reality, one particle has s and the other particle has -s but the minus sign can be extracted out for the second particle so that the limit as s --> b is valid. It is really very simple mathematically and pretty amazing that a mathematician would have trouble understanding such simple physics. Not to be confused with the central limit theorem of probability. I think that's what trips up Richard Gill. Actually, Fred, I don't think it is too hard to understand why a mathematician specializing in probability can fail to understand such simple physics. Gill has declined to define his measure space, so every result is discontinuous with every other -- an infinity of multiply connected spaces. Let Bell loyalists now try to reconcile this belief with LIGO results. I agree with both Fred and Tom. The bottom line here is that Gill has never understood --- nor do I think he is capable of understanding --- that I am working within a simply-connected, parallelized 3-sphere. I have repeatedly stressed this fact, literally tens of thousands of times. It is also quite explicitly discussed in all of my papers, from day one, going back to 2007. Until he understands this elementary fact, there is no hope for him of understanding such an extraordinarily simple calculation I have presented here and above. Some of you may wonder why I bother to expose Gill's unethical tactics publicly, as I have done above --- such as exposing his habit of writing malicious letters to the President of my college and other department heads at Oxford University? What do I gain by washing such dirty laundry in public? Well, it serves a greater purpose of exposing how the Bell Mafia operate within the academic physics community --- and how some scientists in general operate within the greater scientific community. A person who challenges the conventional wisdom is likely first to be ignored, then dismissed and finally, if these responses are inadequate, attacked. The first stage is being ignored. When an outsider sends a paper to established scientists, for example, many will not bother to reply. When an entire dissident field establishes its own publications, it may be ignored by the mainstream. Dismissal is the most common response when seeking formal recognition in orthodox channels. A paper sent to a top journal may be rejected without being sent to referees. Editors often perform a screening function, deciding what is credible enough to warrant serious consideration. Editors can also affect the likelihood of acceptance by their selection of referees. Sometimes, though, dissidents cannot be silenced by ignoring and rejecting them. They may develop their own constituency or gain publicity. For example, nonscientists who point out the healing power of herbs, based on their own observations, are usually ignored by medical researchers. Some researchers carry out careful studies of herbs and seek publication; they are likely to encounter difficulties or, if their work is published, be ignored by the mainsteam. However, there is a thriving alternative health movement which is very receptive to any findings about the benefits of herbs. This poses a threat to corporations, governments, and scientists with a stake in the conventional approach based on synthetic drugs. At this stage, one possibility is attack. A scientist can be attacked in various ways, including ostracism, petty harassment, excessive scrutiny, blocking of publications, denial of jobs or tenure, blocking access to research facilities, withdrawal of research grants, threats, punitive transfers, formal reprimands, demotion, spreading of rumors, deregistration, dismissal, and blacklisting, and threats of any of these. There are numerous documented cases in various fields. For example, many scientists pursuing research critical of pesticides or proposing alternatives to pesticides have come under attack, for example having grants removed or being threatened with dismissal (Martin, 1996; van den Bosch, 1978). Dentists critical of fluoridation have been threatened with deregistration (Martin, 1991; Waldbott, 1965). Government scientists critical of nuclear power have lost their staff and been transferred as a form of harassment (Freeman, 1981; Martin, 1986). Parapsychologists have encountered difficulties in their careers (Hess, 1992). Dr John Coulter, a scientist at the Institute of Medical and Veterinary Science in Adelaide, South Australia, spoke out about about various environmental and health issues. After he commented about hazards of pesticides in a talk, the pesticide manufacturer wrote a letter of complaint to the director of the Institute. After Coulter did a study of the mutagenic potential of a sterilising agent used at the Institute and released his results to the workers, he was dismissed (Martin et al., 1986). Dr George Waldbott, a prominent allergist and author of hundreds of scientific papers, was the leading US opponent of fluoridation from the mid 1950s through the 1970s. Waldbott was visited by a German profluoridationist who misrepresented his intentions, gained access to Waldbott’s files and then wrote a critical account Waldbott’s methods. This misleading account later appeared in a dossier on opponents of fluoridation compiled by the American Dental Association and was used to undermine Waldbott wherever he appeared (Waldbott, 1965). The actual cases that are publicized are the tip of the proverbial iceberg, for several reasons. Many dissenters do not make an issue of attacks, preferring to keep a low profile and continue their careers. Also, only some types of attacks are easy to document, such as reprimands and dismissals. It is very difficult to prove that failure to get a job or grant is due to discrimination. Attacks on dissidents are never admitted as such. They are always justified as being due to inadequacies on the part of the dissident, such as low quality work or inappropriate behavior. To determine whether actions against someone are justifiable, it is useful to use the "double standard test." Is the same action taken against everyone with the same level of performance? Or is the person who is challenging conventional wisdom harassed or reprimanded, while others with similar performance are unaffected? Another useful test is to ask whether the response is in line with normal scientific behavior. If a scientist writes a challenging paper, it should be considered quite legitimate for someone to call or write to the scientist questioning the method or results or complaining about bias. This is a process of engagement and dialogue, and does not jeopardize the scientist’s ability to continue research. Even strong language should be tolerated if it is directly to the scientist or published in a journal where there is a timely opportunity to reply. On the other hand, when a critic threatens a law suit or writes to the scientist’s boss or institution making a complaint, this is obviously an attempt to intimidate or hinder the scientist’s work or career. The "call to the boss" is very common and is an excellent indicator that a response is an attempt to suppress dissent rather than engage in dialogue. Attacks are much the same whether they are made against scientists presenting challenging ideas, against whistleblowers who speak out about scientific fraud or corporate corruption, or against scapegoats who become targets for whatever reason. Most scientists are completely unprepared for attacks. They do not realize that science can be a ruthless power play in which the most underhanded methods may be used against those who challenge vested interests. They believe, incorrectly, that formal channels, such as grievance procedures, professional associations, and courts, provide reliable avenues for justice, when actually they are strongly weighted in favor of those with more money and power. In order to survive and thrive as a challenger, it is necessary to understand the operations of power as well as knowledge. Most of all, it is important to work out a strategy. Needless to say, I highly recommend Prof. Martin's full paper I have linked above. His personal website I have linked above contains many more documents on the suppression of scientific dissent. Richard D. Gill is still arguing with Fred elsewhere on the Internet, and still making his usual fallacious claims about my derivation in this paper, despite the fact that his elementary mistakes have been pointed out to him by me, Fred, and Tom, by now literally hundreds of times: https://www.youtube.com/watch?v=HwyXV6zv7CU. Calculations in my paper linked above are trivial. You have to be either mathematically incompetent, or deliberately dishonest to not understand these calculations. Here are the main points that are worth stressing again: Within the 3-sphere, the EPR-Bohm correlations cannot be anything but E(a, b) = -a.b. There are only three possible ways to get the correlations other than E(a, b) = -a.b. 1)	By knowingly or unknowingly switching the geometry and topology of the physical space from S^3 to R^3. 2)	By knowingly or unknowingly violating the conservation of the zero spin angular momentum. 3)	By knowingly or unknowingly doing either or both of the above. then the correlations are inevitably E(a, b) = -a.b. With the above trivial geometrical identity, it is clear that we can identify the RHS of Eq. (28) with the RHS of Eq. (32) directly, without the intermediate steps. Yeah, I had to exit that debate as there was just way too much dishonesty over and over. The Bell believers just hear what they want to hear and totally ignore the truth. They wouldn't even acknowledge that what they are doing is rejecting the postulates of the local realistic model. But that is in fact what they are doing. If the postulates are accepted then Bell was wrong for sure. And there exists a classical experiment that indicates the postulates should be accepted. But even more, it can be shown that Bell was wrong anyways in the derivation of the inequalities. Bell's theory is junk physics. And, 'entirely contained within its postulates' is the framework for mathematical completeness. thray wrote: Just so, Fred! And you would think that a PhD'ed mathematicians and physicists like Gill and Schmelzer would see that but no, they are way too prejudiced to see the truth. FrediFizzx wrote: And you would think that a PhD'ed mathematicians and physicists like Gill and Schmelzer would see that but no, they are way too prejudiced to see the truth. (1) The spins --- which emerge from a net spin-zero state --- are no longer interacting at the time of their separate measurements along a and b. (2) Only the components of spins along the detector directions a and b are measured by the experimenters, exactly as encapsulated in my model. With an ignorant and closed-minded people like Gill and Schmelzer it is pointless to debate about anything: https://www.youtube.com/watch?v=HwyXV6zv7CU. 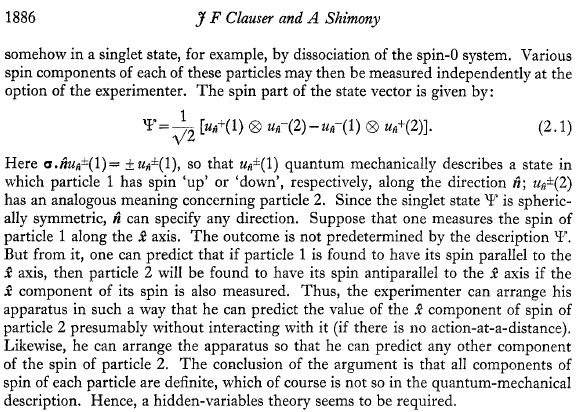 In a pure EPR-Bohm scenario wouldn't the spins actually be directed to a and b? IOW, the Stern-Gerlach device (polarizer) does s1 --> a and s2 --> b exactly like in your math. For the purposes of countering Bell's argument we do not need to know -- or specify -- what mechanism the Stern-Gerlach device uses to detect the spin components. 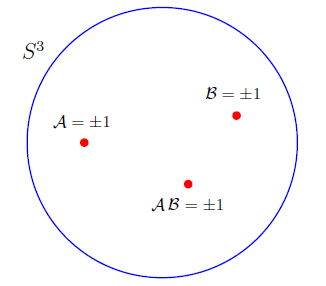 But s1 --> a and s2 --> b, with s1=s2=s, is equivalent to saying that the normalised component of the spin s1 along the direction a is measured by Alice, and likewise the normalised component of the spin s2 along the direction b is measured by Bob. One can write these two detection processes as limits, as I have done in my paper. It is most unfortunate that the physics community has allowed an incompetent third-rate statistician like Richard D. Gill to terrorise original and creative scientists like Caroline Thompson, Karl Hess and myself for the past several decades (I have already noted some of his tactics in this forum: viewtopic.php?f=6&t=115#p3763). These in addition to the publication of the second edition of my book on the subject some years ago (partially funded by FQXi): https://lccn.loc.gov/2012001131. Let me also mention Scott Aaronson in the present context and the despicable tactics he has used to mislead the scientific community about my work. Although he is not a physicist (he is just a computer plumber in my opinion), he is far more competent and popular than Gill. That, however, is no excuse for overlooking his online criminal activities, such as cyber-bullying and lynch-mobbing. I only mention here the misdemeanours of Gill and Aaronson, because they hold professional academic positions, supported by the tax-payers. Therefore they should be held accountable by the physics community for their unethical activities regardless of their positions. Interesting. 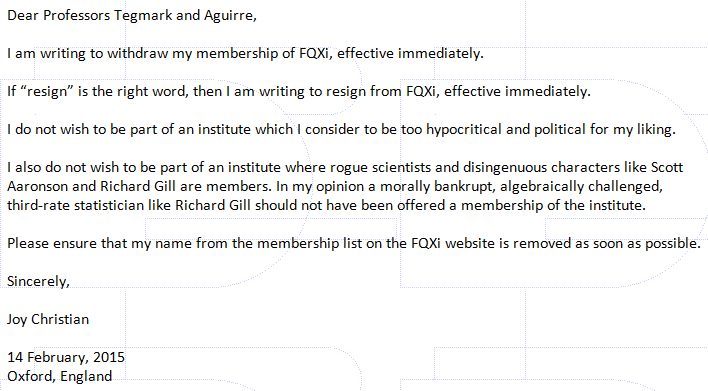 So Richard Gill is now targeting Michel Fodje's academic affiliations and personal background. This is how Gill begins his malicious campaign against his intellectual superiors (ask Professor Karl Hess, for example). This is how he began harassing me and many others before me. He began gathering all sorts of personal information about my background. Then he planted a numbers of incriminating evidence against me on the Internet, such as a fake letter from my PhD advisor and some blog posts elsewhere in my name (as if I had written them), before bombarding my academic superiors with malicious letters and emails about me, such as to the President of my College at Oxford University. His motivation behind these callous acts had been to debilitate me personally, financially, and academically, in order to eliminate the threat I posed to his vested interests. Now he has began to target Michel Fodje's academic affiliations and personal background in the same manner, because he now sees him also as a threat to his vested interests. But Michel is very careful, and hence untouchable. Gill is not going to be able to harm him. Gill has succeeded in harming me to some extent, for example by finding some political alliances against me within my College in Oxford, but in the end his malicious efforts have only made me stronger. So with me too Gill's malicious intensions and campaign have ultimately failed. Actually, this brief message does not really capture the extent to which people like me, Prof. Karl Hess, and others are harassed by some unscrupulous Bell fanatics.